In recent years and through the buzz echoes from various articles from various publications the world over, L.A. Witch have sustained themselves as an indelible specter to the Los Angeles indie circuits. 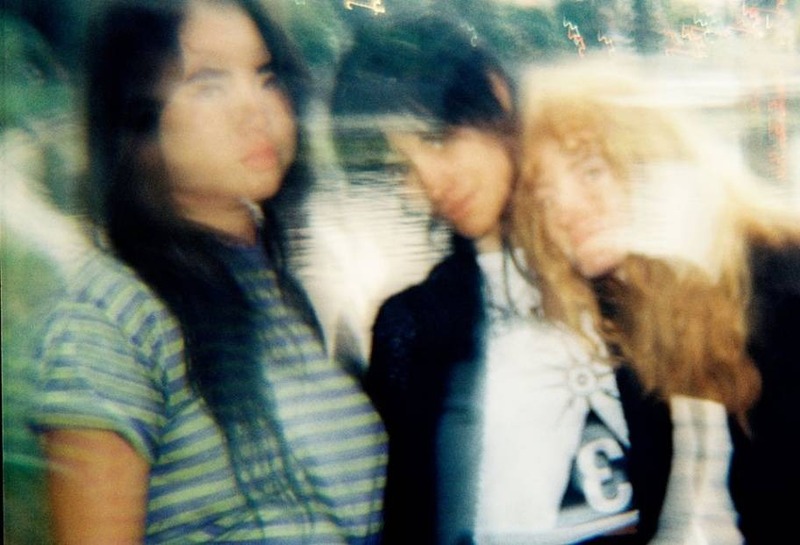 The current line up of Ellie, Irita, and Sade are about to release their debut EP March 18 on Manimal, but first a listen to the dead soul shaking and amplifier earth-quaking bruiser, “Get Lost”. The amazing thing about “Get Lost” is that it embodies practically everything that has made you love the rock and roll artifice and medium for however many decades you feel like counting. L.A. Witch drink from the gold goblet of pagan rebellion, detaching themselves from main-way packs, to the close-fisted shouts of, “I don't need nobody else.” The guitars create the sensation of anxiety felt around some of L.A.'s cuttiest corners, with lyrics ripped from the wildest apartment complex yelling matches, and domestic disturbances. This is where So Cal's sorority of the night sing a song of dysphoric fallouts that transforms the city of angels into a network of caverns and covens. “Save me from my self, take me where you go, to get lost from myself, to get lost from my soul.” The “get lost from my soul” denouncement becomes the drifter's creed, as guitars and percussion illustrate the air of every pool hall in town, and the jukebox machine glow of every DIY dive and haunt in the entire L.A. area. The three of you have generated some buzz lately. How was it that the three of you forged the coven, that is L.A. Witch? Irita: I had been jamming with some girl friends (who were our original guitarist and drummer), and our friend Tony introduced us to Sade. We played as a four-piece, then became a three-piece, and then went through a bunch of drummers. Sade suggested that we jam with Ellie, who she knew from a previous band. Ellie: I actually met Sade in high school, we used to play in a two-piece band together. It's cool to be playing with her again. The whole witch concept is something that has pervaded through a lot of different platforms, from snarky sub genre titling like “witch house”, “witch gaze” and whatever else; what is the L.A. Witch's attachment and attraction to these spell concocting damsels? Irita: Used to love watching The Craft. To me, witches really typify strength, darkness and mystery, which was something we all could relate with. Sade: As far as the band name goes, I guess we just thought it was a powerful name—a witch being not only someone that can be wicked, but someone that can also be sanctified. It just made sense in our heads, being all women and feeling strong. And why do you feel that the witch craze is so much more relevant than say the over-exploited zombie trend? It seems the mainstream can't get away from the whole zombie craze, (like vampires, or something). Irita: Witchcraft lore has existed for hundreds of years, whereas the zombie thing has only been around for the last 50 years or so. The traditional witch archetype isn't really as relevant today as it probably was in the past (scapegoating, religious zealotry, adultery, etc. ), and a zombie apocalypse could technically still happen, so it's probably better to learn about zombie apocalypse survival. Are any of you country fans? Ellie: Of course. There’s so much cool country music out there. Sade: Lee Hazlewood is one of my all time favorites. His baritone voice melts my heart. I bought Cowboy in Sweden on vinyl not too long ago. Johnny Cash is another favorite. Irita: Yes! Johnny Cash, Hank Williams, Marty Robbins, Patsy Cline, Merle Haggard, Townes Van Zandt. Also really dig The Byrds “Sweetheart of the Rodeo”, early Flying Burrito Brothers and Gram Parsons' solo stuff. And The Stones' country-heavy songs have always been my favorite. How do you feel the sound of L.A. Witch has expanded over the past three years? Ellie: There have been a few members that have come and gone and that always changes to the vibe of the music. Irita: When we first started the band, some of the girls had never played music before and so we were really limited by what everyone was capable of doing. Sade: It's definitely gotten louder. I feel like with “Get Lost” and the upcoming EP your sound has gotten more righteous, wilder, and burns even brighter with the vintage bar beer light illumination. Irita: King Eddy Saloon—oldest bar in LA, used to have the best vintage beer signs. “Get Lost” is such a heavy, self exploring, self loving number that somehow manages to save its very own soul on the song's accord. How did this soul searching, lost and found number come into being? Sade: I wrote this song about an ex-boyfriend. Before we had met, I was living in really low-life conditions. He found me and guided me through some severe hardships. He had a huge impact on me in terms of spirituality. “Get Lost” is the feeling I had at the time of that relationship, whether it was good or bad. Best ways to get lost in LA, with “Get Lost” playing on a car stereo loop? Sade: Over the 6th street bridge downtown, going real fast. Favorite things happening in LA these days? Sade: The James Turrell exhibit at LACMA and grilled cheese sandwiches at Heywood. Irita: Bowling and beer at Shatto 39 in Koreatown. Warm weather and barbecues. L.A. Witch's debut EP will be available March 18 from Manimal, and you can find them playing the Burgerama pre-party at The Observatory with The Orwells.